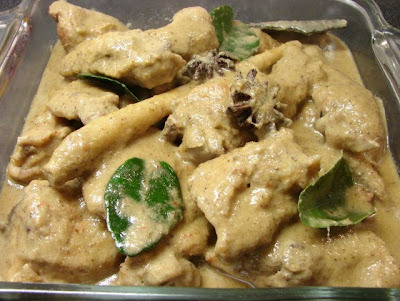 Opor ayam is one of the popular chicken curry in Indonesia/Malaysia/Brunei areas. Two common curry spices like chilli and turmeric are not required. This curry is fragrant with spices but not spicy hot and quite creamy with coconut milk. Quite easy to make once you have got the spice paste and whole spices ready. Very tasty with just plain rice or Malay pressed rice called lontong. I like this with pineapple curry (pajeri nanas). To make this curry, either use one whole chicken cut into large chunks or use drumsticks and thighs pack. This recipe will feed 4 – 5 people. 4 – 5 kaffir lime leaves or 2 salam leaves (salam leaves are difficult to find where I am so I only use kaffir lime leaves). Leave leaves whole or lightly crushed. Dry roast coriander, cumin, fennel and peppercorns for few minutes till fragrant. Then ground in a pestle and mortar or electric grinder till fine. Ground shallot (or red onion), galangal, ginger, garlic, candle nuts and chilli to a paste using pestle and mortar or electric mini blender. Mix with dry ground spices. Add a little oil to a wok or large frying pan. Heat till hot and fry chicken pieces till brown on the outside for few minutes. (Chicken does not have to be cooked through). Remove chicken and most of the chicken fat/oil leaving about 2 tbsp and add about 4 – 5 tbsp of coconut milk, stir fry ground spice paste and star anise and cassia bark for about 5 - 8 minutes or till fragrant. Keep the paste moving to prevent sticking. Add about 1 - 1.25 cup of water plus remaining coconut milk, lemongrass, tamarind and 1 tsp salt, let this liquid come to a boil. Add chicken pieces and simmer for about 25 minutes then add kaffir lime leaves. Continue simmer for another 5 - 10 minutes till chicken is done and sauce is slightly thicken. Taste and see if you need any more salt. Thanks for your recipe. My children love this style because it is not spicy. My grandaunt used to cook this but she used a lot of tumeric and onion and we named it Goo Poh (not opor) curry. Sometimes instead of coconut milk she used evaporated milk and some huge fresh tomatoes. that would again change the quality of the curry. The spices remain the same. Your curry really looks good. thanks. Thanks Sarawakiana. Curry is one of those recipe you can change the ingredients and still very tasty. Other than opor ayam another mild curry is kurma curry Malay style which is also very nice.